Characters are the people or animals in the story. We can use adjectives (words to describe) to describe a noun (person, place or thing). In a story, they often tell us more about how a character looks or feels. They can tell us what someone or something looks like (short, tall, thin), colors (blonde hair, blue eyes, green grass), feelings (sad, happy, lonely, angry). While Reading the Story below, look for adjectives, words that "tell" us more about the characters in the story: Cinderella, the Step-Sisters, Step-Mother and the Blue Fairy. Then check what you've learned after Reading the Story with our at home or at school activities. Drawn by Ava, age 13. Thank You! Cinderella looked around her. "Did that even happen?" But there she stood in a fine gown, and with a golden band in her hair. And there were her driver and four horses before her, waiting. “Come here,” said the Prince. Cinderella stepped up to him. The Prince got down on one knee and tried the glass slipper on her foot. It fit perfectly! Then, from her pocket Cinderella took out something. It was the other glass slipper! WHAT IS YOUR CHARACTER LIKE? Use three Adjectives to tell us about your character. Like this- My character is kind, ________, _________. 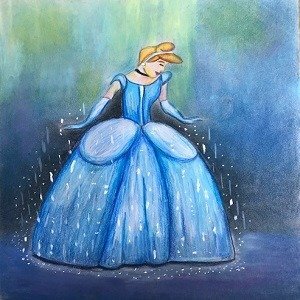 What Kind of Character is Cinderella? Remember: Adjectives tell us more about a character, such as what someone or something looks like or how they feel. Words such as (short, tall, thin), colors (blonde hair, blue eyes, green grass), feelings (sad, happy, lonely, angry). Use these extra Activities to explore Characters at home or in school. The Velveteen Rabbit Audio Story Podcast for Kids The Velveteen Rabbit Audio Story for Kids. A toy rabbit learns that through a child’s love it can become real.